LET US TAKE CARE OF THE SNOW FOR YOU! from October till December 31st, 2018 and you will receive a Complimentary Snow Clearing Service, that is right! We will clear the snow from your driveway, city sidewalk, path during the winter. Take winter off with us this year. This is a 90 days service. Clearings would be to maximum of six clearing each month. Valid only for Saskatoon city limits, Warman and Martensville. Certificate is transferable to any person customer choose to. Not valid for rural properties, businesses. Some conditions may apply. Dealer can change promotion anytime without notice. Service provided by Monkey Business, Snow Clearing Service. See Kia of Saskatoon for details. 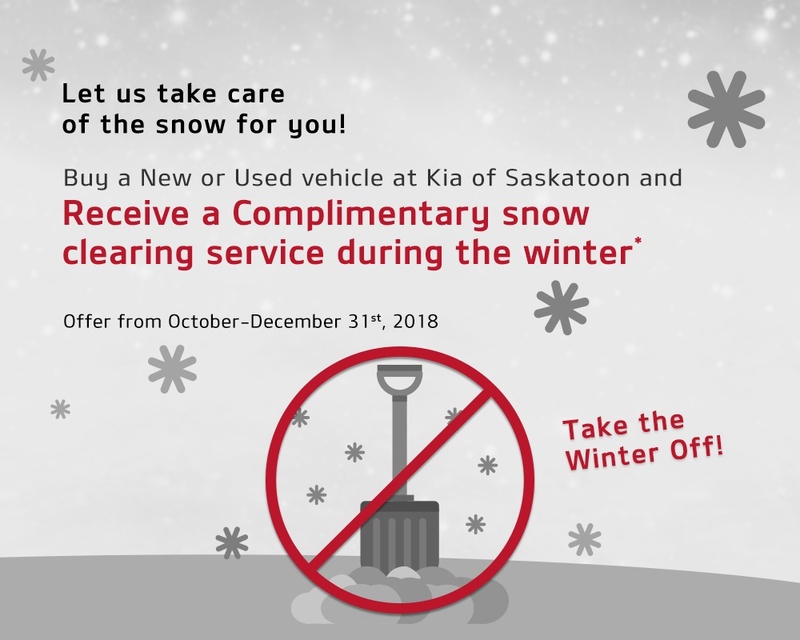 Take the Winter off with Kia of Saskatoon!